with support from ICLEI USA. This blog post was originally published on CityTalk – A blog by ICLEI on 27 Feb 2018. Cincinnati has been actively engaged and working to reduce its carbon footprint for many years. In 2008, the first Green Cincinnati Plan set the goal to cut emissions by 80% by 2050. Since then, the city has achieved an average annual carbon emission reduction of 2%. In 10 years alone, Cincinnati has reduced its carbon emissions by almost a fifth, with help from the ICLEI ClearPath tool to conduct regular greenhouse-gas inventory updates, forecast emissions trends, and visualize the impact of the city’s various climate actions. While reducing carbon emissions, the City’s sustainability projects have also led to economic savings for both local government budgets and Cincinnati residents. The city-wide Energy Aggregation Program purchases energy for 80,000 households. By leveraging the resident’s buying power, the City is able to provide residents and businesses 100% green power while simultaneously reducing participants energy bills by 10%. 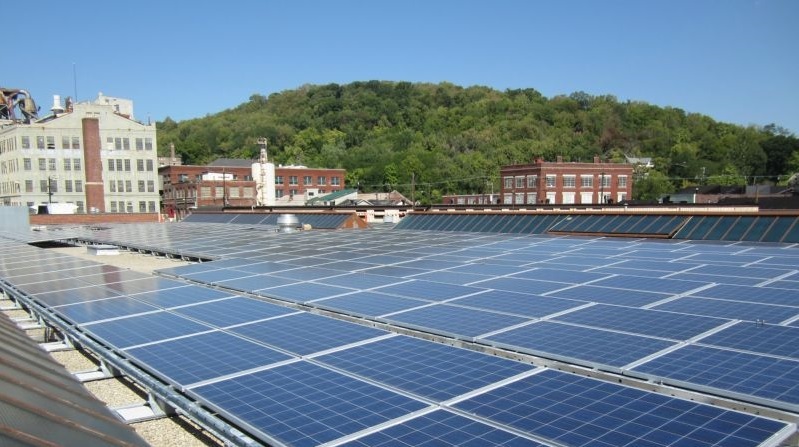 The Solarize Cincinnati initiative boosts local solar production by bulk buying solar panels and cutting costs for residential homes and business premises by 20% compared to retail. As of January 2018, almost all city facilities including administrative buildings, police stations, hospitals, civil society centers and City Hall will be powered by 100% green energy, also cutting city government’s carbon emissions by 9.1%. While Cincinnati still has over 15 years to reach their goal in 2035, many core challenges remain. Policy and regulatory barriers are making it more difficult to expand renewable energy production. While some state governments offer tools and incentives to encourage investment in renewable energy, Cincinnati’s home state of Ohio does not yet have these in place. Virtual net metering – a practice which allows individuals or organizations to sell energy produced on their roofs to others in the community – is currently not permitted in the State of Ohio, therefore limiting available solar expansion opportunities. At the federal level, the US government recently announced its intention to impose tariffs on imported solar panels from key exporting countries, which will impact costs and the growth of solar energy generation in the US, cutting local solar jobs and delaying the transition process. In addition, fossil fuel energy production remains very low cost due to an abundant supply of natural gas in the surrounding region. These challenges are not stopping Cincinnati. If anything, they cement the city’s determination to make its roadmap work with the resources available. At a recent CiBiX (City-business Collaboration Accelerator) event – an early-engagement platform that enables cities and businesses to co-identify partnership opportunities and challenges and co-create new solutions – Cincinnati shared the details of its latest RFP (request for proposal) to develop the largest municipally-owned solar array in the country. The 25 MW (megawatt) onsite solar plant will bring energy investment opportunities closer to home by making use of underutilized land such as the land around the runways of Cincinnati’s Lunken Airport. In announcing the project Cincinnati Mayor John Cranley stated “In the past year, climate change has cost the City of Cincinnati more than $50 million dollars responding to floods and landslides. Today, we are pledging to invest a similar amount to reduce climate change, move to energy independence, and achieve a financial return on investment” The project is an example of how the city government plans to fast-track solar energy partnerships with businesses and residents to make the most of the Business Energy Investment Tax Credit – a policy incentive which provides up to 30% tax rebate on solar investment expenditures – but is scheduled to decrease in the upcoming years. Cincinnati’s experience of turning policy and plans into tangible initiatives and projects presents a valuable learning resource for cities that have also made the 100% renewable pledge or have aspirations to do so. Cincinnati is already sharing their hard-earned know-how through the Urban Transitions Alliance, an ICLEI-led initiative that connects industrial legacy cities who are leading new pathways for sustainable and inclusive development.